With the Apple Watch coming out this Monday, it’s important to ask, “Why would anyone want this?” It’s a valid question. It’s a question I asked when people started sporting watches with calculators on them decades ago. And the answer then was the same as I believe the answer will be today: no one does. But in this case, Apple has an installed base of people who think being a college educated upper middle class person requires having lots of Apple devices. 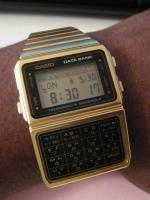 So I figure the Apple Watch will fare better than the Casio Databank. But still, I’m going to think them silly until I’m wearing one. And at best that will be a long time because I’m a late adopter. Just ask Will. The one thing about the Casio Databank Apple Watch that does make it potentially useful is being able to pay for your groceries by holding your forearm up to the cashier as if you were using some until now secret Vulcan ability. Or perhaps better, a Jedi trick, “These are not the groceries that must be paid for.” Of course, it is just normal Apple technology — namely, Apple Pay. And Apple Pay is the system that Eddy Cue told us absolutely, positively could not be hacked! You know, because no information was being transferred. I know that I can be hard on Apple. It isn’t that I don’t like the company. I think that in general, it is a great hardware company. It tends to be overpriced. And over the last decade, the quality has really slipped. But it’s still good. What it is not — and what it has never been — is a good software company. And that’s fine as long as they completely control the hardware platform. But when not, expect problems. But in this case, Apple’s claims about security was just hubris. Nothing is ever that secure — especially when it comes to money. And the first fixes that Apple has released for this problem seem to have made things worse. This, of course, is one of the big reasons that I’m a late adopter. I really don’t see what people get from being an early adopter. When people excitedly show me new stuff, I am not impressed. I am grateful. I think, “Thank you for doing the beta testing so that this technology will work properly by the time I finally decide to use it.” Of course, in the case of the Casio Databank Apple Watch, I’m skeptical. As it is, I long ago gave up my watch for my phone. Unless I can talk on my watch, I don’t see the point. And I don’t buy that much broccoli anyway. I’m more a cauliflower man, myself.